All Cash Offer: This doesn’t mean your cash, it simply means that you are paying the seller in one lump sum. You could be wholesaling the home or purchasing it yourself to do a rehab or rent it out. Either way, you must get it at a discount price. Our All Cash Offer Formula in step 4 of any property is a sure-fire way to make the correct offer to the seller. Seller Finance Offer: One of the most profitable strategies and is a great way to purchase property without going to the bank. Lease Option Offer: This is what we call a ‘Terms’ offer. Meaning… how much down, month and how long can I do this for (days, months, years). Here, you are giving the seller options and forces them to choose one, instead of just saying NO. Even if your seller says that they cannot take payments, offer it anyways, because what they say in the beginning may be different than what they accept. When you make multiple offers, each offer has its positives and negatives. Although the cash offer may be the lowest on sales price, they will receive all their money upfront. If they want more on the sales price, they may elect to go with one of your other offers. Either way, you just need them to say yes to one of them. 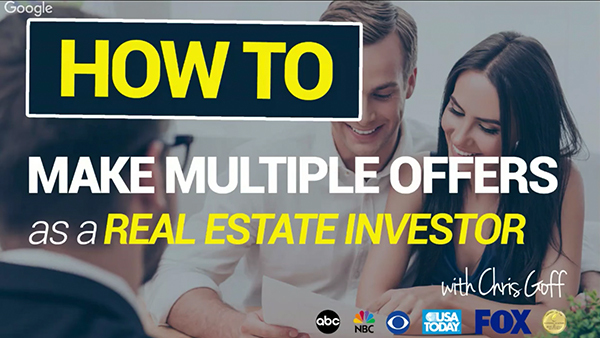 Start making multiple offers and watch your acceptance ratio go up, increasing sales and helping more people. Use REIPro’s Deal Analyzer and step 4 to make the offers and always try to present them in person.